Raising questions. Pursuing answers. Curating and categorizing. That’s how we support the QM system. A founding principle that continues to drive Quality Matters is the need for QM Standards to reflect current academic research on effective learning. The initial standards and subsequent modifications have been based on the insights of teams of experienced online instructors and instructional designers and on the best practices standards promulgated by accrediting bodies and national and international organizations. In addition, the QM Standards have been examined for consistency with the conclusions of the educational research literature regarding factors that increase learning and engagement and that improve learner retention rates. 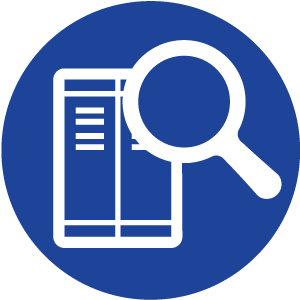 Search our curated selection of literature bearing a relationship to the QM Standards by either keyword or the QM Standard number. References on teaching competencies can be found in the Online Instructor and Teaching Competencies Literature Review. Get guidance on developing a research question that will make for a solid study and facilitate attaining information significant to online learning stakeholders. See a curated list of studies and publications related to the primary categories of QM Research. Need help with your search? Contact QM Research with your questions. Get details on the permissible use of the Quality Matters (QM) materials most often requested related to conducting and citing QM in research. The Changing Landscape of Online Education (CHLOE) project is a joint research effort by QM and Eduventures that seeks to bridge the gap of information and data available about important trends in online learning as it shifts to a more mainstream component of higher education. A synopsis of two studies regarding optimal length of videos used in online instruction. This multi-year study by QM and Eduventures fills an important gap in the research of online learning management trends. Read about the results from the most recent survey in CHLOE 3: Behind the Numbers (2019). Two additional reports are also available: CHLOE 1 (2017) and CHLOE 2: A Deeper Dive (2018). 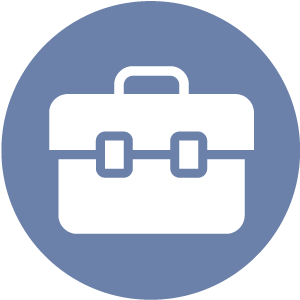 A list of the research-related webinars hosted by QM with recording links. Hear from QM Members and others about the online learning and QM-related research being conducted. 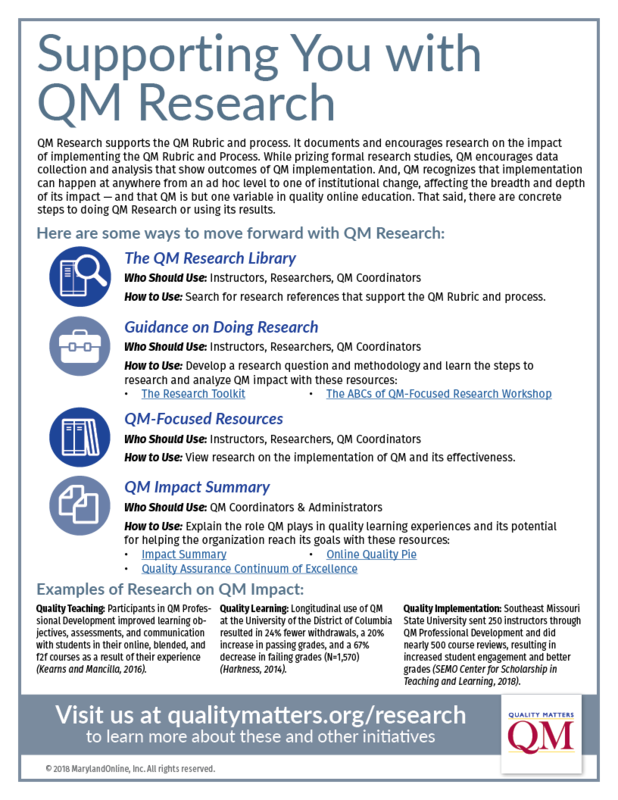 Examples of QM Impact and the variables associated with research into QM. • 2017 — Vol. 31, Issue 3 of The American Journal of Distance Education (AJDE) is a special issue on Quality Matters. • 2015 — Vol. 29, Issue 3 of The American Journal of Distance Education (AJDE) is a special issue on Quality Matters. These editions, or individual articles, can be accessed from a subscribing research library. The 2015 Update to What We're Learning from QM-focused Research. Read what we've learned from more than 10 years of QM. QM and the EDUCAUSE Learning Initiative co-hosted a webinar on Designing Effective Online Courses: Proven Organizational Structures and Models in March, 2017. 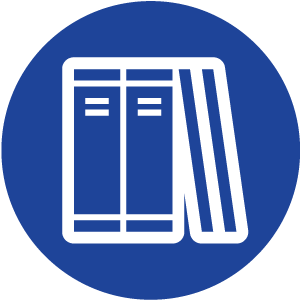 The K-12 Literature Review Summary presents the research literature findings that support the K-12 Rubric. Conducted and written by Dr. William C. Diehl, builds upon a previous study that was led by Jurgen Hilke in 2012. Dr. Lorna R. Kearns and Rae Mancilla's study investigated QM impacts across delivery formats. The special issue of the online journal Internet Learning from spring 2014 features articles based on presentations from the 2013 5th Annual QM Conference. Send them a link to the Research page or download a PDF to print or send digitally.